Author Rob Boffard sent his latest book, "ZERO-G," racing for the stratosphere for an author reading at the edge of space. A new sci-fi novel launched on a truly fitting mission last month, as documented in a new video: Rob Boffard's "Zero-G" cruised to the upper stratosphere for a very unusual author reading at the edge of space. The book ascended via weather balloon on Jan. 18 from the town of Ross on Wye in southern England. Once the rig got high up in the sky, an audio recording of Boffard reading the prologue and the first chapter began to play loudly. Boffard's crew documented the process in an extended video, as well as through tweets as it all happened. Fittingly for "Zero-G" (Orbit, 2016) — the sequel to Boffard's first novel, "Tracer" (Orbit, 2015) — both the liftoff and the recovery proved more of an adventure than the team had anticipated. 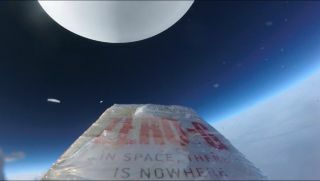 After making it about 105,000 feet (32,000 meters) into the sky, where the curve of the Earth was visible, the book detached from the balloon and plunged back downward, according to the author's tweets. But the attached GoPro camera stayed put and captured the unprecedented stratospheric reading. The team then tracked the balloon by satellite as it caught the jet stream and zoomed far from its starting point. The group finally retrieved the camera and recording from a faraway field and declared the mission a success — even though the the book itself was lost in the process.